You knew it was over when: Ohio turned the ball over on downs with 2:59 remaining in the game, trailing 28-19 to the no. 15th ranked Tennessee Volunteers. Three plays later, the Volunteers ran out the clock and moved to 3-0 while the Bobcats fell to 1-2. Ohio did their best to keep the game close. Four Louie Zervos field goals kept the Bobcats within two points of the Vols at the half, 14-12. After three touchdowns in a week two victory over Virginia Tech, Tennessee quarterback Joshua Dobbs once again churned out a three-score performance in the non-conference win over the Bobcats. Dobbs hit wide receiver Josh Malone on a pair of 20-yard scores. The first capped off Tennessee’s opening drive, a three-play, 55-yard scoring march to open the game’s scoring. The second capped off the scoring and put Tennessee up by two possessions with just over 11 minutes left in the game. Malone finished as the team’s leading receiver, hauling in five passes for 69 yards and two scores. Following Malone’s second visit to the end zone, Ohio went three and out. 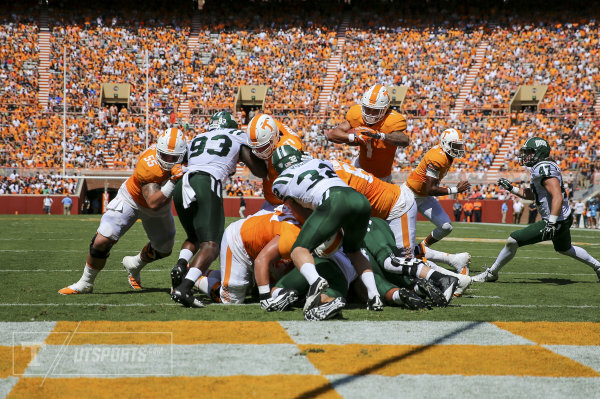 Tennessee took a 14-6 lead on Jalen Hurd’s one-yard touchdown run on the first play of the second quarter. Hurd ran for 61 yards on 15 carries in the win. Tennessee running back Jalen Hurd’s one-yard touchdown run gave the Volunteers a 14-6 lead in the second quarter. (Photo: UTsports.com). Ohio quarterback Greg Windham only managed to complete 50 percent of his passes, but played turnover-free football and threw Ohio’s lone touchdown of the loss, a four-yard scoring toss to Jordan Reid that made it a 21-19 game with 1:09 left in the third quarter. The Bobcats return home following the loss in Knoxville to host Gardner-Webb at Peden Staium on Saturday, 2 p.m. The Runnin’ Bulldogs of Gardner-Webb come to Athens with a 1-2 record. They followed their season-opening win over Elon with back-to-back losses; September 10th at Western Carolina and last week vs. The Citadel. Ohio will look to even their record at 2-2 before starting MAC play on October 1st against Miami OH.